on the latest versions of redwaves lite, the facebook like box is getting cut in half if you display the widget in the sidebar. This happens with the included "redwaves facebook like box" widget, as well as all the 3rd party "like box" widget plugins I could find. Any chance we can get a fix for this? Please give me a link to your website or take a screenshot of your sidebar and upload it here. From the widget settings, you can set the width of the Widget. 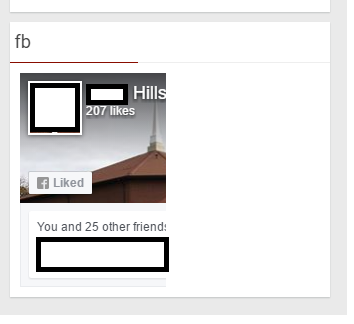 The FB like box widget maximum width will always be limited with the width of your sidebar. I edited out the picture and personal identifiers, but I think you can see whats happening. The whole right side gets chopped off no matter what I set the width to. Well, that's strange! Can you send me your website URL via PM? Couldn't figure out anything from the screenshot. The widget seems to be working just fine so that could be caused by a CSS rule. Any advice on getting this plugin to work properly with your skin? Thanks!! I found the culprit, and a fix. Hopefully this helps anyone else who encounters this! This code will only affect the FB widget when placed in sidebar. This will prevent conflict with your Simple Share Buttons plugin. Also, 297px is optimal for your sidebar. It's hard to notice a difference of 3 pixels but this just to make your FB widget fully visible. Sorry for my delayed reply. If you still having issues, feel free to reply to this topic ( or start new topics ).